User friendly, convenient and reliable paper towel dispenser. Can dispense 2 predetermined sized paper towels based on the position of the lever to reduce wastage. Built from hygienic high grade stainless steel. Vandal resistant. Ideal for high traffic washrooms. The paper remains hidden in the cabinet until the lever is activated downwards. The paper remains clean and dry from outside influences, thus, preventing cross contamination. The body shell incorporates inspection slots to facilitate roll level inspection. It is unnecessary to open the cabinet to check the roll levels. 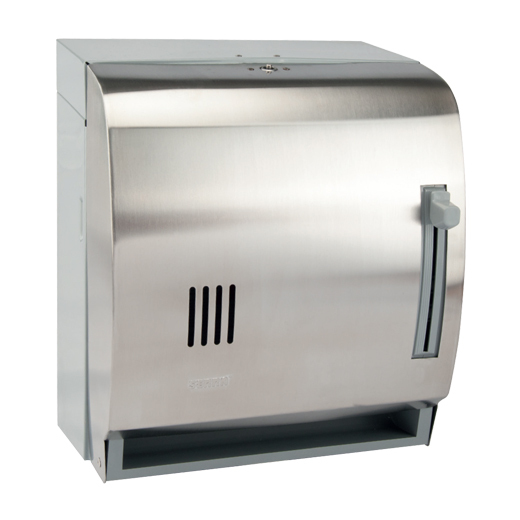 The Serra Lever Control paper towel cabinet incorporates the Snaplock locking system, opens by key (barrel type) only and locks automatically by simply securing the front cover back into the closed position.